Finding the best muscle building supplement is tough. There are tons of different supplements, pills, powders, and other substances which claim to give you athletic benefits. But only a few deliver. Check out the articles below to find out what the best muscle and fitness supplements are for you. The right ones can really accelerate your training. 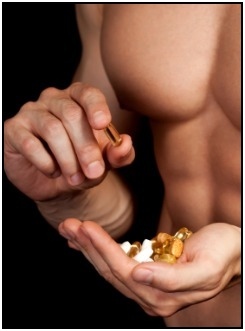 Find out what the best muscle and fitness supplements are. There's a whole lot of B.S. out there. Using the best muscle building supplement for your needs greatly increases your performance. Take only the few that will give you real gains. Pros and Cons of Creatine: Should You Use It? Learn about the pros and cons of creatine. It's possibly the best muscle building supplement out there, but it might not be right for you. Want to know the what the best creatine supplement on the market is, and why it's the best for building your muscles? Find out! From a scientific point of view, this article explains how creatine builds up your muscles. This is interesting, and helps you understand why you have a 'loading phase' when you start taking creatine. How to take creatine to get the best results. It's all around the best muscle building supplement, so learn when and how much to take to start getting stronger as soon as possible. By saturating your muscles with carbs that they can use for fuel (glycogen) before exercise, you'll be able to keep your energy level up. And it's pretty simple to do. Check out how to do carbohydrate loading with just a few simple diet changes. Use these 7 exercise and hydration rules to perform at your best. Fluid intake is a simple and cheap thing to get right, and when you do it really helps your performance. Sport Drinks vs Water: What Should You Drink? Find out if sport drinks are really worth it. There's a lot them on the market, but this article will help you sort through them and find the top ones. Taking caffeine can give you tons of athletic benefits. Find out what kind of benefits you get, as well as how to take caffeine to get those benefits. Learn how caffeine affects weight loss, and how you can get some of the benefits. It definitely isn't magic, but it may give you the extra oomph that you need. Royal Jelly Supplements: Do They Really Work? An evaluation of how well royal jelly supplements work. They've been used for a long time in China, and even Bruce Lee took them. Find out how much they deliver after all the hype! Green tea is actually a great supplement for fat burning. Find out how green tea makes you thinner, as well as how to take it to get the best results. Is ZMA the best muscle building supplement? One of the best? Or just more garbage. Shortcut For Muscle, or Waste of Your Money? If you like this info about muscle and fitness supplements, then you'll enjoy my monthly E-Zine, Starting Strong. It keeps you updated about info added to Complete-Strength-Training.com, as well as bringing you select articles and tips. Sign up below! • Click here to leave 'Your Best Muscle Building Supplement Questions Answered' & go back to the Home-page!